- Toaster. Not kidding. A toaster. 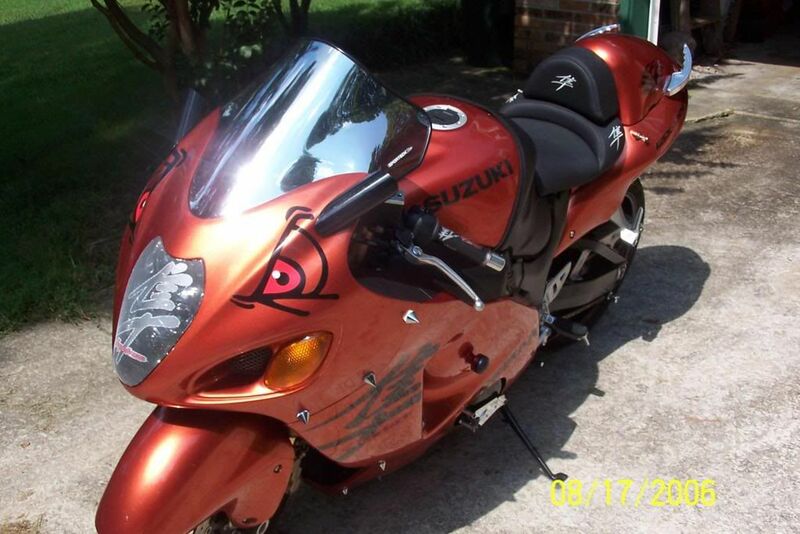 - Suzuki Hayabusa Motorcycle, stolen from a lowly construction. - Okay, so we all know how a toaster works yes? Put in bread, pull down the thing, and it shoots out later, right? WELL. It's ammunition is bread, and Guido can, and will, when bored enough, shoot toast at people with it. High velocity toast, aye, since his power allows the toaster to sort of bypass its usual launch trajectory, but it usually feels like being slapped by a balloon animal, and smells like crispy deliciousness. Called Trusty because in anyone else's hands, trusty shoots toast sporadically, as it isn't QUITE in the best state of repair. - Lone Star is a motorcycle stolen by Guido on the run from Typhon in Auckland, like, not too long ago. It is red and black, and as it IS a Hyabura, it can hit a top speed of nearly two hundred miles per hour; a speed Guido uses with a fine amount of proficiency, surprisngly enough, considering that's FAST. Guido tends to speak Italian, Chinese, German, Spanish, Maori, English and Sign Language. This is just what this site needed, MORE bread related violence! !